Instructions: For more photos please visit here: https://wp.me/p2MuRN-1dc. Click here to view a larger photo of this project. Assemble the box according to the instructions and decorate the box with the paper collection with the flowers and hexagons at the top right corner. Adhere lace and the blue rick rack trim around the box as shown. Stamp the hexagon images from the HCPC-3850 Patchwork and Pockets Stamp set in a variety of colours - Vibrant Pink, Forget-Me-Knot, and Buttercup, Sunflower and Leaf Green inks. Colour the pink hexagons lightly with Vibrant Fuchsia, blue hexagons with French Ultramarine and the yellow hexagons with Buttercup ink and the green hexagons with Vivid Chartreuse inks and die cut with the coordinating die. Adhere over the left side of the top of the box. Stamp the zig-zig images from HCPC-3850 Patchwork and Pockets Stamp set in Fern Green and Vibrant Fuchsia inks on white cardstock. Colour in with Vivid Chartreuse and Vibrant Fuschia inks before die cutting with the coordinating die. Adhere to the right of the box as shown. Stamp the pocket image from the HCPC-3850 Patchwork and Pockets Stamp set in Cobalt Blue ink on watercolour paper. Paint with French Ultramarine watercolour paint and die cut with the coordinating die. Shape lightly and adhere over the hexagons and the zig-zag images. Stamp the rose vine images from the HCPC-3834 Leafy Accents Stamp set in Library Green ink on white cardstock and colour in with Leaf Green and Fern Green inks before die cutting with the coordinating die. Shape using the coordinating mold. Add Crystal Clear glitter over the leaves and adhere over the pocket and the top right flower images. Stamp the flower images from the HCPC-3859 Buttons and Bloom Stamp set on the Super White cardstock in a variety of colours - Vibrant Pink, Forget-Me-Knot, and Buttercup. Colour the pink flowers lightly with Vibrant Fuchsia, blue flowers with French Ultramarine and the yellow flowers with Buttercup inks and die cut with the coordinating dies. Colour the blue flowers on the edges with Majestic Violet inks. 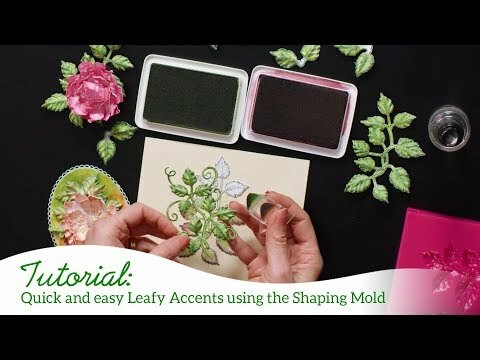 Shape with the Deluxe Flower Shaping kit and adhere over the leaves as shown. Stamp the button images from the HCPC-3859 Buttons and Bloom Stamp set on white cardstock cardstock in a variety of colours - Vibrant Pink, Forget-Me-Knot, and Buttercup, and Vermillion. 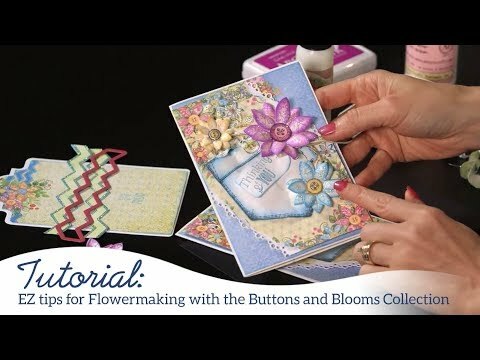 Colour the pink buttons lightly with Vibrant Fuchsia, blue buttons with French Ultramarine and the yellow buttons with Buttercup ink and the red buttons with Vermillion inks and die cut with the coordinating dies. 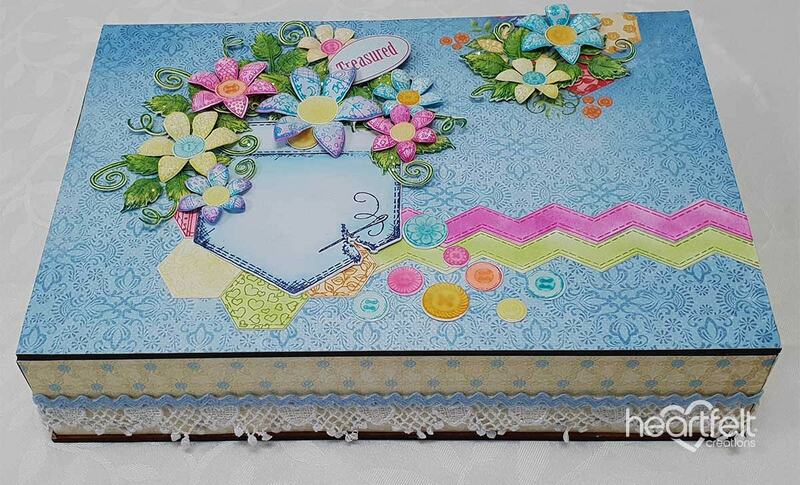 Adhere the buttons to the centres of the flowers and on box as shown. Finish the buttons with 3D Crystal Lacquer.